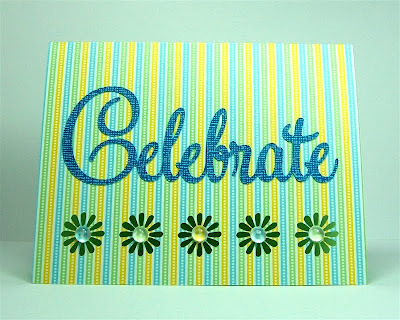 This is a very simple card with a twist. 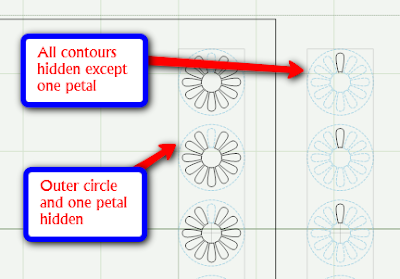 I used the hide selected contour option in Design Studio to create the border of daisy cutouts. 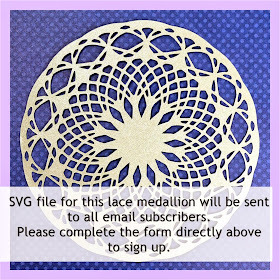 If you are a regular reader of my blog, you know that this is one of my favorite features in the Design Studio program. I have heard that it will soon be available on the Gypsy as well. 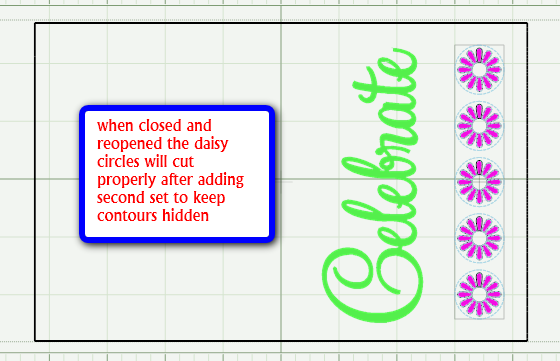 This screen shot shows the location of the daisy in a circle that I used to make the card. 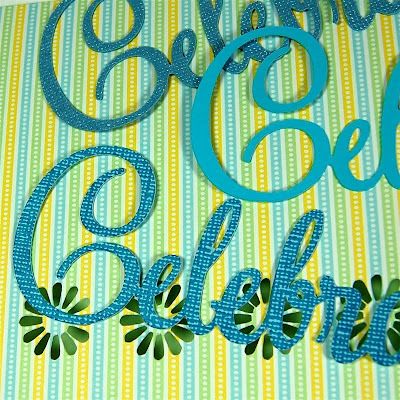 By using "hide selected contour" to eliminate the circle, the negative space will cut into the card. 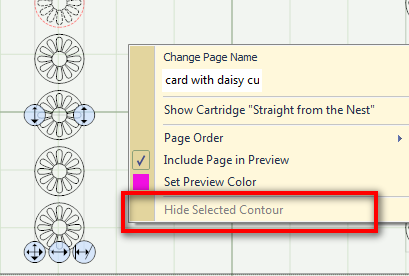 There is an issue with the "hide selected contour" feature. If you only hide one line of an image, it will not stay hidden when the file is closed and reopened. I figured out a way to solve this problem and wrote about it back in February of 2009 (here is a LINK to that post). I thought I'd explain it again since many people who are new to my blog or Design Studio might not know how to do this. 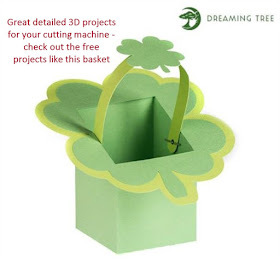 As long as the image that you are using has more than two contours this solution will work. 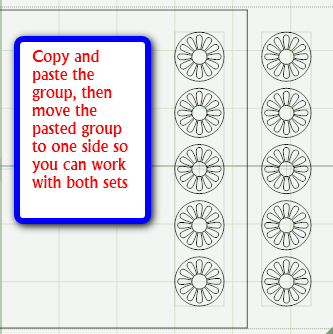 You need to copy and paste the item or group of items so that there are two identical copies to work with. Then use the handles to move the new set to one side so you can see both sets clearly. 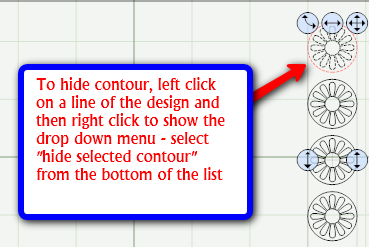 Remember, to hide the contour you left click on a line of the design. The line will turn pink or red. 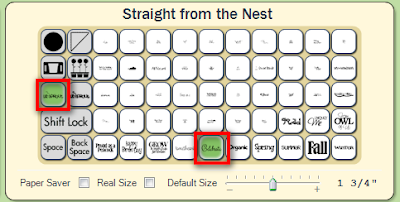 Then right click on the mat and choose "hide selected contour" from the bottom of the drop down menu. When the line is hidden it will turn pale blue. 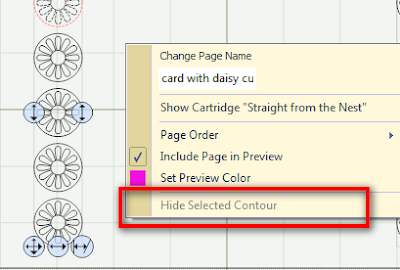 When you do this you will find that "hide selected contour" is not available on the copied set of images (it will be grayed out in the drop down menu). Simply save the file and then reopen it from the file menu - this will make the feature available to use on the copy. 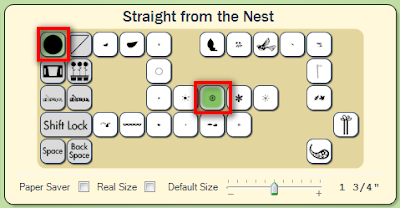 To solve the problem of hiding only one line you should hide the line you want hidden and one more line in the image. Then, on the second copy of the image, hide all of the lines except for the one extra line that you hid on the first copy. When you have hidden the proper lines, check the X and Y values for the original image by clicking on a line to make it active (handles showing). 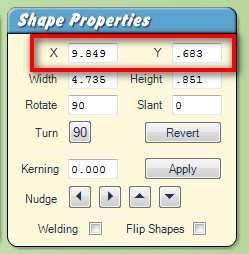 Then select the copied image and enter exactly the same values in the X and Y boxes for that image. 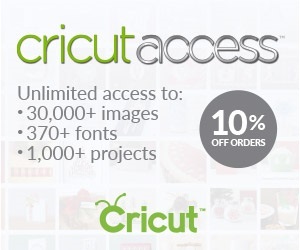 Now, when the file is closed and reopened, your design will still work. If this all seems like too much work, you can also put a note on the file reminding you to hide the lines each time you use the file. 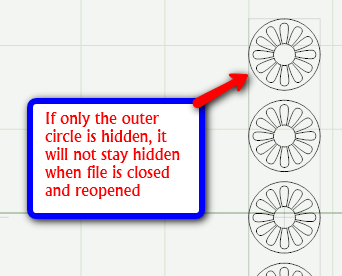 I go to the trouble of setting the file up this way so that when I share files with new users they won't run into a problem when they try to cut the design. The "Celebrate" sentiment is also from the Straight from the Nest cartridge. 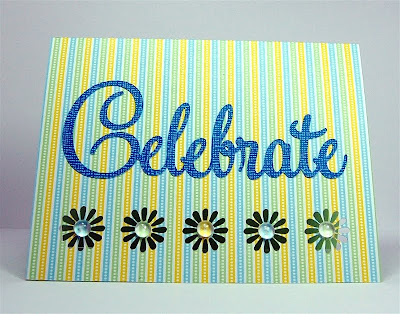 Here is how the card looks after cutting. I may try to lift the petals and transfer them for another card. 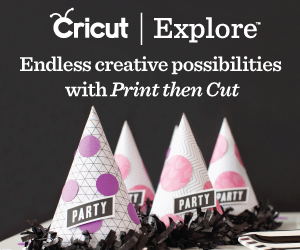 This is a interesting way to use the offcuts but I am not sure if these will be too small to transfer successfully. 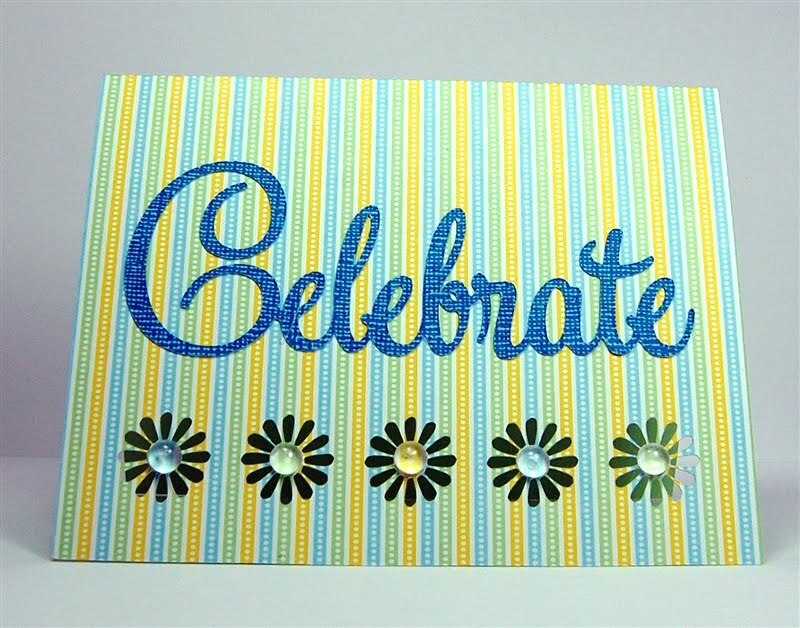 When I looked at the centers of the flowers, I thought that they could use an embellishment but the mood of the card was too casual for "bling" in the form of gems. I looked around my studio and saw this bowl of "Skittles" (small plastic flat-backed drops). These were very popular a year or more ago but they come in bags of thousands - I can't be the only person who still has a lot of these still sitting around! 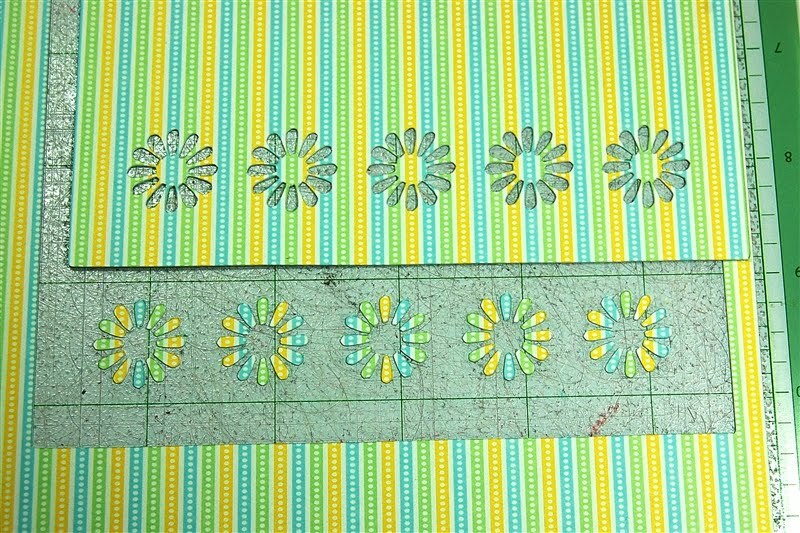 It turns out that they are a perfect fit for the centers of the daisies. I tried several options for the sentiment. First, some blue gemstone Core'dinations (at the top). This looked too formal for the light mood of the card. Next, some plain light blue cardstock which seemed too flat and a bit too bright to coordinate. 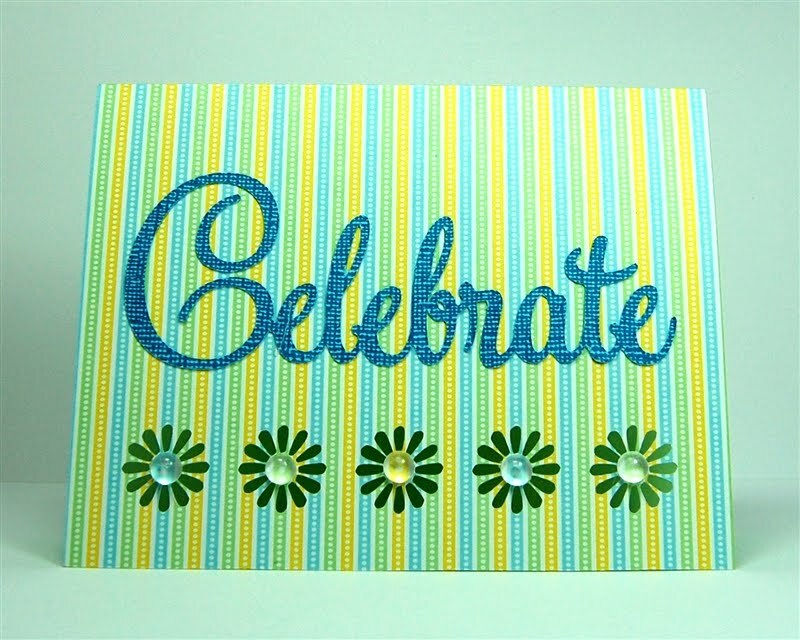 Finally, I settled on some textured Core'dinations cardstock in a darker shade of blue. I thought this one was "just right." 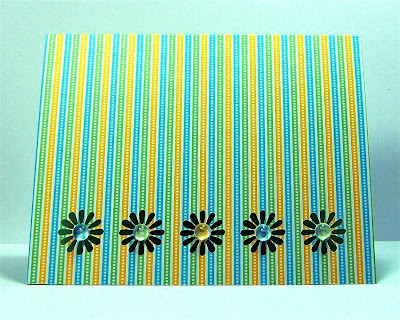 The cardstock I used for the card was from a Martha Stewart baby boy stack. 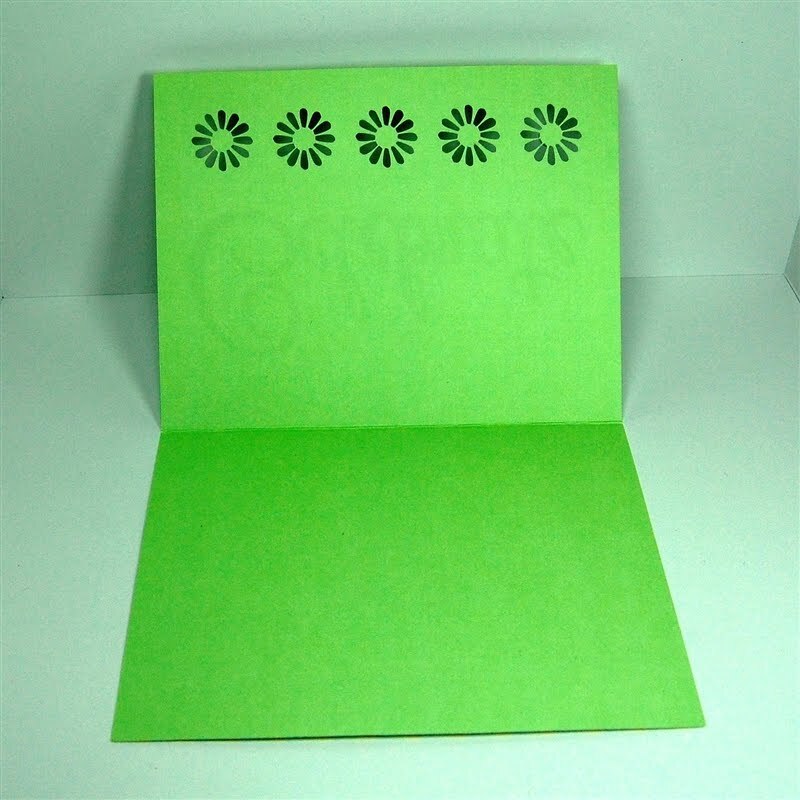 It is solid green on the opposite side and will be suitable for writing without an additional liner needed. This is a simple card but it has just enough of a twist to make it interesting. I hope you like it. If you make one from the file I'd love to see it. You can post it on the new Capadia Designs Facebook page, here is a LINK. Love your tutorials, thanks for sharing! Wish you did this with the gypsy too! Very cute card! I've never thought to do cutouts on my cards that way. Will have to give it a try. Your card is so lovely!!!! The daisies are so pretty! Love this! Thanks for taking the time to teach us how to use the hide contour feature on the DS. 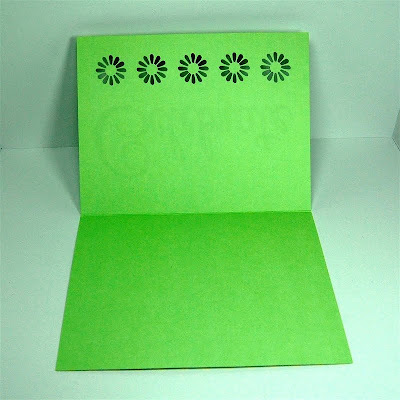 Great card and tutorial. 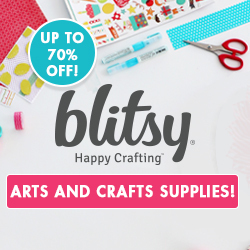 I think I am going to have to buy design studio but I just bought 5 new carts at Custom Crops as they have a huge sale on, just right for a newbie like me! Thanks so much for sharing your talents with us! 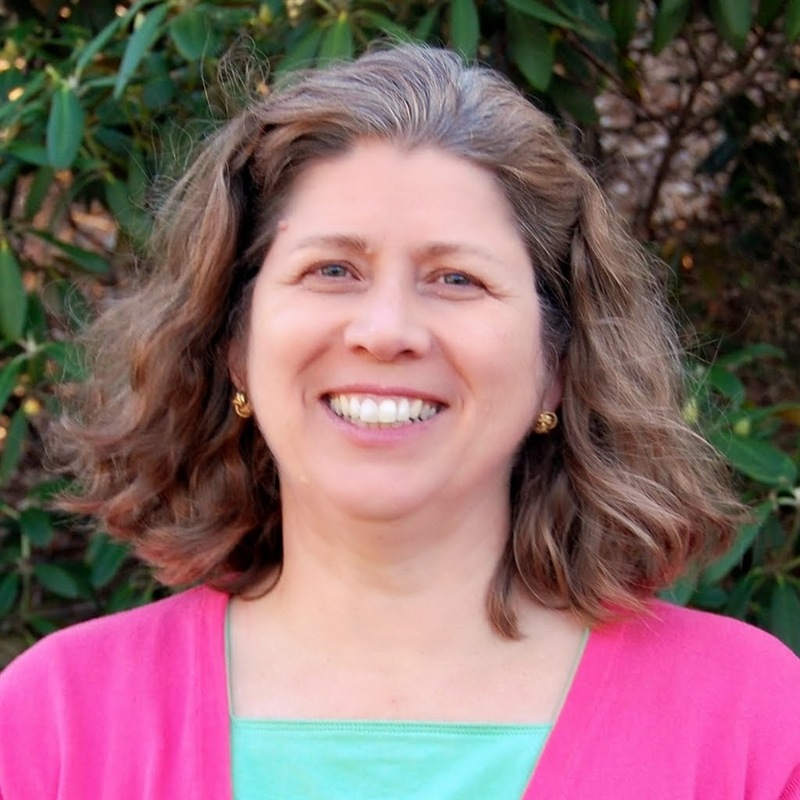 Love your work and appreciate your teaching even more!! I love your card! Just wondering if the five daisies were on one button? 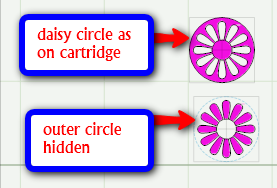 When you showed the screen shot of the daisy you chose, it looked like it was an individual daisy. If they are individual, how do you group them all together and move them around? Wonderful idea and thanks for explaining how to keep the dropped contour lines, I would be one of those people that would open it and say What Happened and completely forgot. TFS all your hard work to make it easy for the rest of us. Beautiful card and thanks for sharing all your hard work. Thank you so much for such wonderful directions. I haven't had a chance to use DS much yet but now I'm ready to jump in! There is just one daisy on the key. 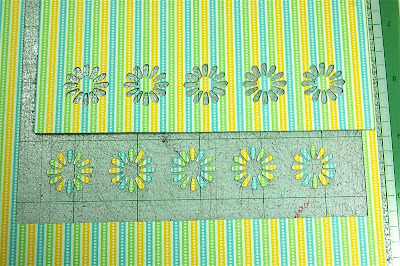 To make a group of five, just place one on the mat and click the daisy four more times without clicking somewhere else on the mat. 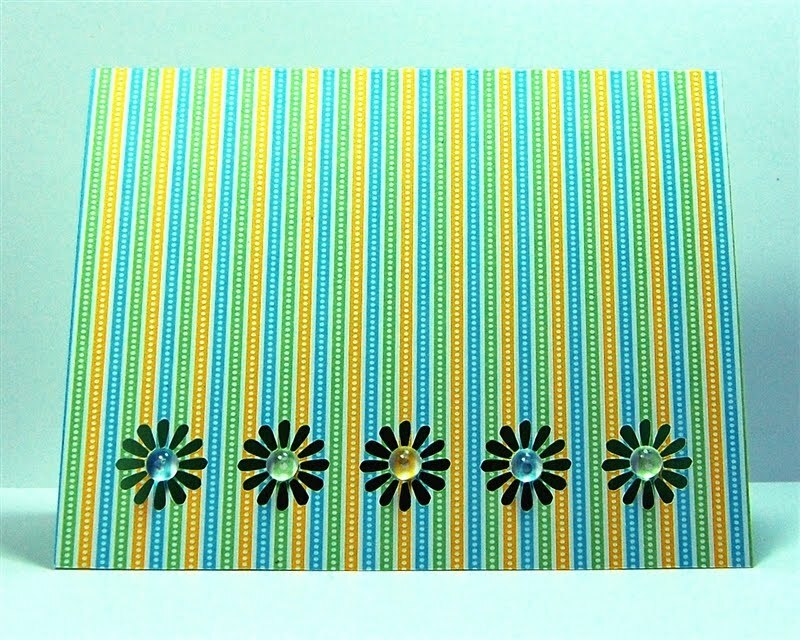 You will have five daisies surrounded by one set of handles. All elements within the same set of handles are grouped so you can resize and rotate them all at once. This type of grouping has always been in Design Studio. 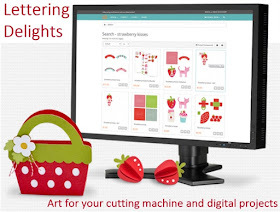 It is the ability to group items that you have individually altered that we are all waiting for! Please let me know if you have any more questions about how this works. You are too good. Thinking this stuff through gets me sometimes. TFS. Yes I have 10 million skittles hanging around my space, I think I've used 3 over the years. You are a few up on me. I LOVE your detailed instructions - Thank you :) I have so much to learn about the DS!! I really like this card Diane. It's simply elegant. Thanks for the refresher tutorial too! 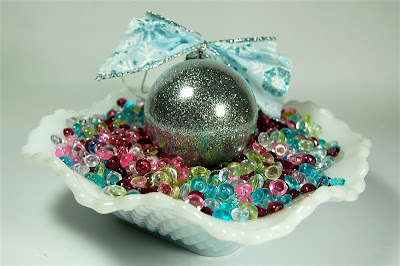 Wow this maybe simple but it looks elegent. Love this feature, since you first posted it back in February it has made me look at my cartridge handbooks in a different light.